If you like Rick and Morty and want fun slippers then you just need these Rick and Morty slippers. The slippers come in a range of sizes so that men and women of many shoe sizes can enjoy them. 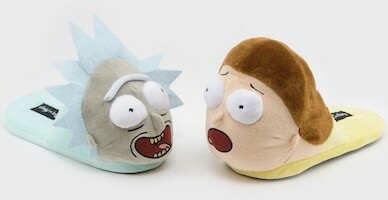 And as you can see on the picture each slipper looks different as one is Rick and the other one is Morty and that makes it extra fun when you are wearing them. Now you can just walk around the home with Rick and Morty on your feet and your feet don’t have to get cold any more this winter as Rick and Morty will keep you warm. If you like warm feet and Rick and Morty then you just need this Rick and Morty socks. 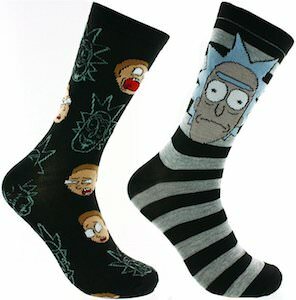 The socks include 2 pairs of socks one pair is black with on it images of Morty and line drawings of Rick and the other socks are black and light grey striped and show the face of Rick on it. So no more boring plain socks for you because Rick and Morty can now be part of your outfit as it just looks way more fun then your old socks. Now there is a Rick And Morty spaceship Christmas sweater and it is just what you need for your ugly Christmas sweater party. 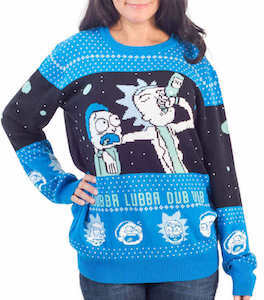 The Rick and Morty sweater is unisex so that both men and women can enjoy wearing it and it comes in sizes Small – 3XL and is made from 60% cotton and 40% acrylic. The Christmas sweater is light blue with a dark blue middle section that shows the galaxy and it looks the same on the sleeves, front and back. On the front of the sweater you can find Rick drinking and beside him, you can find Morty. The back of the sweater shows the famous spaceship that Rick uses to travel around. Get ready for Santa by wearing this fun holiday sweater. If you like Rick from Rick and Morty then you should check out this Rick t-shirt. The t-shirt is available in many styles for both men and women and it comes in many colors too and in sizes Small – 6XL. On the t-shirt is says in big letters “Rick” and next to it you can see Rick himself but he is just a silhouette but you still clearly can see it is him. 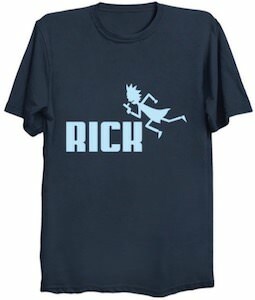 So if your name is Rick or if you want a cool t-shirt about Rick then look no further as this is the perfect t-shirt for you. 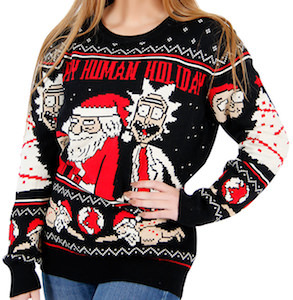 Now there is a Rick And Morty ugly Christmas sweater and it is really ugly unless you like Rick And Morty. The Christmas sweater is unisex and that makes it perfect for men and women and it is made from 60% cotton and 40% acrylic and comes in sizes Small – 3XL. The black Christmas sweater shows Santa Claus on the front with next to him Rick And Morty and above it the text “Happy Human Holiday” and below it all a naked Santa flying through the sky. On the back of the sweater, you can see an exploding Santa. It is a strange Christmas sweater and that makes it just perfect for your holiday party. 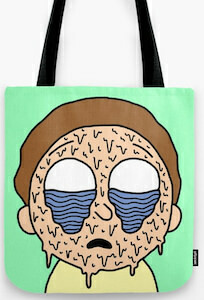 If you like Rick and Morty and want a nice tote bag then you should check out this melting Morty tote bag. The tote bag shows the same image on the front and back and it shows a portrait of Morty but he looks a bit different. The hair of Morty and his shirt look normal but his face looks like it is melting just like your ice cream does. The Morty bag has a green background and that makes this a really cool bag. The Rick and Morty tote bag is available in 3 sizes 13, 16, and 18 inches and is square and each bag has a nice strong black carry strap that is 1 inches wide. If you like Monopoly but want something different than you want to check out this Rick And Morty Monopoly. 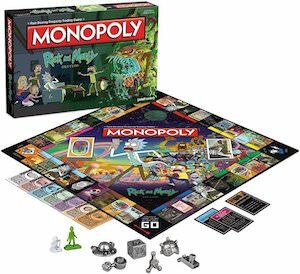 The game idea is the same as the original Monopoly only this game has a special board with locations of the Rick And Morty comics. And it has special money and game pieces too so that you can really get into the feeling of Rick And Morty and you will be still playing Monopoly. Now a rainy day at home will be extra fun because you have this cool Monopoly game ready to play with your friends and see who can get the most money. 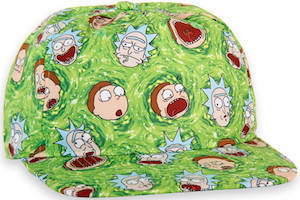 If you like hats and Rick And Morty then you should then come get this green Rick And Morty hat. It is a snapback hat and that means that many people can wear it as the size is adjustable. The hat is green in color that makes me think of slime with Rick And Morty you never know of course. On the green, you can find many faces of both Rick And Morty and they are having many facial expressions on it making it looks really neat and strange. So if you head is cap less than no more looking because you found the coolest hat out there. 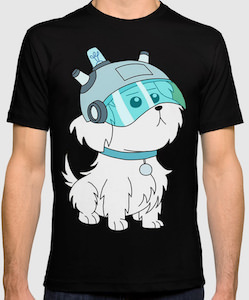 If you like Rick and Morty and the dog Snuffles then you need this t-shirt. On the t-shirt, you can see a big picture of Snuffles the family dog wearing the special head piece that you know from the Lawnmower Dog episode. It’s a cool dog on a t-shirt to everyone that didn’t see the Rick and Morty episode and for the fans, it will be an amazing t-shirt. And you can get this Rick and Morty dog t-shirt is available in styles for men and women and it comes in a wide selection of colors and in many sizes. Now there is a Rick And Morty shower curtain for in your bathroom. 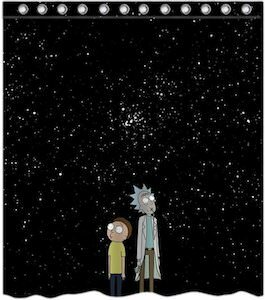 The shower curtain is black and shows many white starts and Rick And Morty are standing on the bottom in the middle and they are staring at the night sky. The shower curtain is 66 x 72 inches and has nice enforced eyelets for your shower hooks. Now your shower can look amazing all thanks to Rick And Morty as they love to mess up your life as much as they seem to be doing to their own lives.